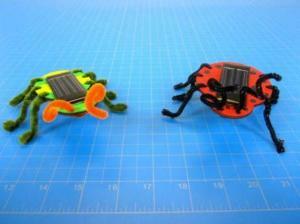 Our Solar Bugs teach how solar power can be converted into motion. By connecting a 2 V solar cell directly to the vibrating motor, we've created a small solar project that can be used to a number of different concepts. When placed in sunlight, the vibrating motor causes the bug to wiggle around. This project allows students to flex their creative muscles while also learning about solar power, motion, and vibration. We recommend personalizing your Solar Bugs by painting, staining, or coloring the wood bodies before assembly. This kit comes with everything you need to build 2 Solar Bugs! Ordering information: Parts include 2 2V Solar Cells; 2 Vibrating Motors (pre-soldered to Solar Cells); 4 Chenille Stems; 2 Laser Cut Wood Bodies; and 2 O-Rings.